Happy New Year! As you can see from my prior post, the latter part of the year zipped by with no time to write here. A lot was brewing, however, which is now determinedly chugging along, and it’s all about pigeons and prints! My all-consuming project for this year is Moving Targets, my collaboration with Steffi Domike that links our shared cultural heritage and family migrations to the story of the passenger pigeon. 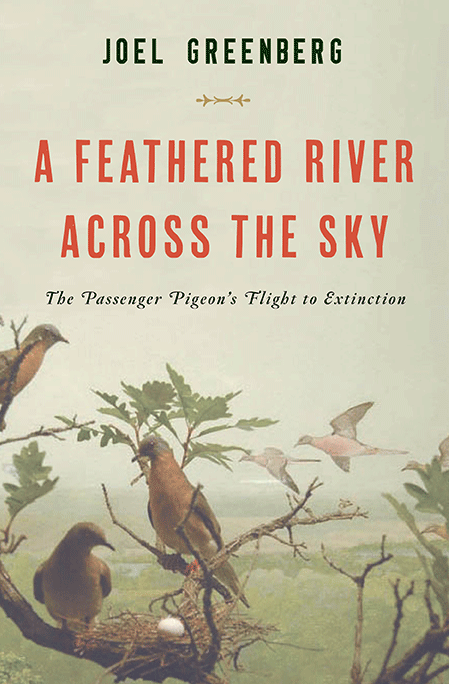 This project is affiliated with a much larger effort by author and historian, Joel Greenberg, who has launched Project Passenger Pigeon to bring attention to the centenary of the extinction of this unique species and draw connections between its plight and our relationship to non-human nature. Joel’s just released book (left) has received several notable reviews, and he has a full speaking schedule. You can track his whereabouts here. You can read our project summary and see our work in progress on my Portfolio page (tab above). Moving Targets first exhibition venue will be Brushwood Center at Ryerson Woods in Deerfield, IL, opening May 4, through July 6. Along with our own work, we are curating a “Passenger Pigeon Portrait Gallery” for their library room, which will feature 14 artists, each representing a state/region in the former nesting range of the pigeons. As part of our research for the project, we have been delving into our family histories and lineage, with the help of archeologist Ruth Fichman. 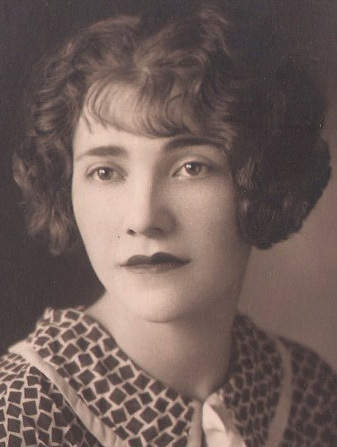 She has been an invaluable addition to our team and has unearthed significant information about my mother’s family who lived in Chernigov, Ukraine and immigrated to Alberta, Canada around 1910. With the loss of my mother (left) when I was 6, I also lost many connections to my maternal family. With this project, I feel I am coming home to the family I thought I did not have. It has been thrilling and healing. As part of Moving Targets, Steffi and I are each creating a visual journal/album that will interpret the story of our mother’s families. A secondary project is a tabletop etching press, which I purchased with a friend (see LOCUS tab above). I have wanted a press for years, and now I finally have it! Currently, we are exploring techniques and capabilities of the press. Eventually, I want to offer classes out of my studio. I love the surprise and unpredictability of printmaking, as well as the varied imagery that can be produced! 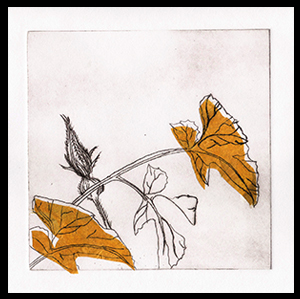 My recent prints reflect my ongoing study of botanical art, using the simplest method of intaglio printmaking–drypoint. The image is drawn directly onto a plate with a hard-pointed needle. 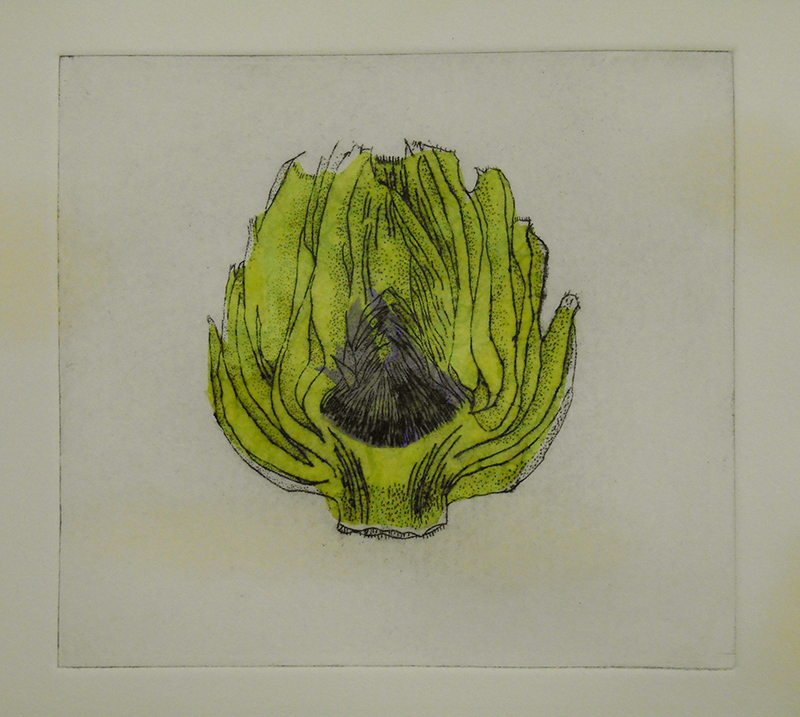 Traditionally, the plate was copper or zinc, but today Plexiglas is also used, as I did in this print. Throughout the centuries, artists such as Albrech Durer (1471-1528), Joris Hoefnagel (1542-1601), and Maria Sibylla Merian (1647-1717) used this method among others to make “copies” of their original drawings. After an image was printed in black, it was often hand colored with watercolor paint. Color is added to the print at left using the technique of chine colle (collage). Colored rice papers are placed on the inked plate, with an application of glue on the top surface. Then the dampened printmaking paper is carefully placed over the top, coming in contact with the glue. The print is then run through the press. I am interested in mimicking and improvising on early botanical techniques, which suggest an historic period that predates modern science–a time of discovery, exploration, and wonder in the natural world. 2014 is looking to be a busy, demanding year with Moving Targets being exhibited in three or more venues and weekly printmaking sessions. Stay tuned for updates on both! The summer whizzed by, with two trips to New York, one to the Northwest, and a recent visit to Chicago. 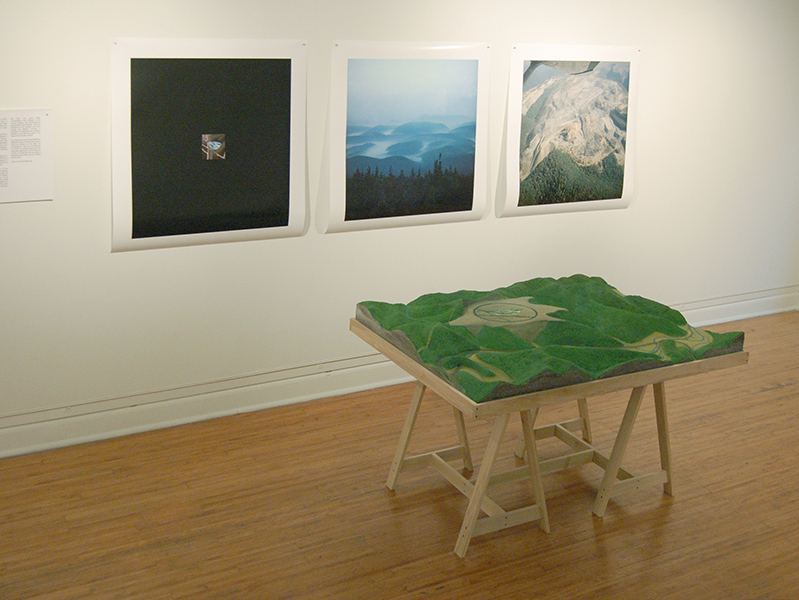 The first trip to New York was for the opening of Regenerative Infrastructures at the Arsenal Gallery in Central Park. 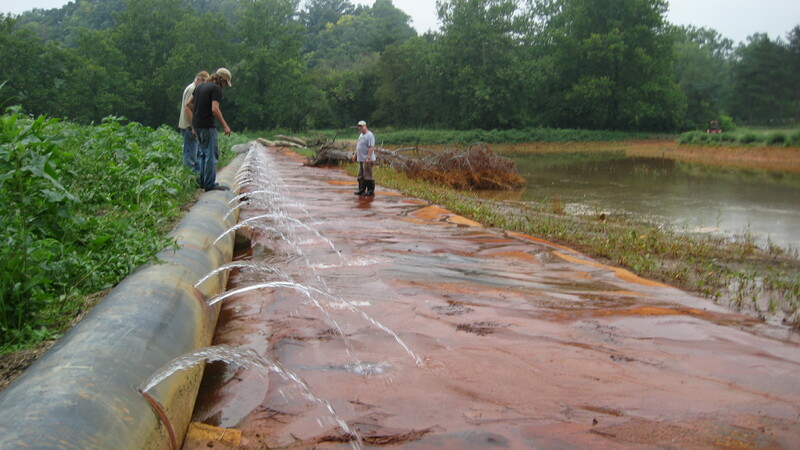 My return trip on August 22 was for a presentation at the gallery–a reading of my essay from the Regenerative Infrastructures catalog accompanied by a slideshow. The slides ran independently and were designed to be suggestive rather than informational. 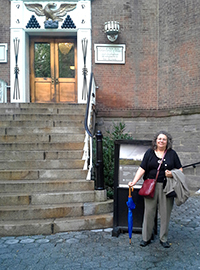 On both trips, I had the pleasure of visiting NYC museums and the High Line with Elizabeth Monoian (LAGI). Some highlights were the James Turrell exhibition at the Guggenheim, The Civil War and American Art at the Met, and the Museum of the American Indian which featured a suite of compelling contemporary Native American prints from Crow Shadow Press. My northwest sojourn was comprised of inspiring studio visits with Ann Leda, starting off at Vashon Island. We traveled first to visit Jo Hockenhull in Salem, OR where we spent a few glorious days making prints in her studio (which inspired me to buy a press — see the LOCUS page above). Then on to Joan Stuart Ross’ studio in Nachotta–a gorgeous spot on the Washington coast, where Ann and I indulged in making encaustics. I was less pleased with my results than my print (left), but I learned how to layer with wax! On returning to Vashon, I spent my last day and evening with art historian Susan Platt and her architectural historian husband Henry. Susan and I were joined by Barbara Bruch, my old studio mate, for a tour of Buster Simpson‘s retrospective at the Frye Museum, followed by a great barbequed chicken dinner in Susan and Henry’s enchanting garden. My last trip of the season was to Chicago to visit with Joel Greenberg, author and instigator of Project Passenger Pigeon, who was a fantastic tour guide. Day 1: Passenger Pigeon dioramas and mounts at the Field Museum; Day 2: field trips to an old growth beech forest where the pigeons nested, a field where they were shot, and some birding nearby; Day 3: a site visit to Brushwood at Ryerson Woods where Steffi and I will have our exhibition next May. Fall season to dos: Teaching one class–American Art History at AiP; working on Moving Targets with Steffi, getting the press up and running, producing a few LOCUS events, writing at least one grant (for MT), continuing with my botanical illustration including a History of Botanical Illustration course at Phipps, several maintenance and organizing projects, and the list goes on…! Oh, yes, and my continued involvement in Remembering Hiroshima, Imagining Peace. Happy Fall–Celebrate the wondrous bounty of the earth! I am pleased to announce that my essay “Redefining Beauty in the Context of Sustainability” is the lead essay in Regenerative Infrastructures: Freshkills Park, NYC. This lavish, hard-bound volume features thoughtful essays and stunning photographs of the Land Art Generator Initiative’s 2013 Competition, published by Prestel. Get your copy at Amazon! I’ll be in NYC June 26 for the book launch and exhibition of the winning entries at Arsenal Gallery in Central Park. See the LAGI event page for details. Pittsburgh artist Rose Clancy and I are co-curating “Sustaining Systems,” an exhibition of 12 local artists/projects for the Americans for the Arts Conference in Pittsburgh on Saturday, June 15. As the the last stop on AFTA’s Green Arts Spaces and Initiatives ArtVentures tour, the exhibition will feature a broad sampling of environmentally themed works, including realized and proposed restoration projects, installations, and discrete artworks. A public reception from 7-10pm will follow the tour, and there will be an open house on Sunday, 2-5pm. The venue will be LOCUS, my studio and social practice venture, in the neighborhood of Bloomfield. See the web site for a preview of the exhibition and more info. 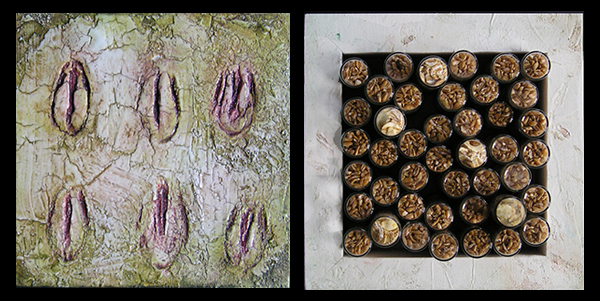 A few examples follow of the work of Connie and Tom Merriman and Angelo Ciotti whose installations will be in the show. Rose is designing a beautiful little catalog funded by GPAC and the Art Institute of Pittsburgh. My collaborator Steffi Domike and I are hard at work on our art installation Moving Targets for the 2014 centenary of the extinction of the Passenger Pigeon. Moving Targets parallels the migration and demise of the passenger pigeon with the diaspora of our mothers’ families from the Ukraine to this continent. 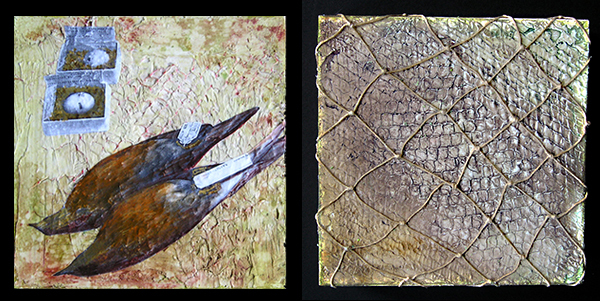 We are pleased to be exhibiting this project May 4 – June 29, 2014 at Ryerson Woods art and nature center near Chicago, which will coincide with their annual Smith Nature Symposium, the theme of which will be Extinction/Survival. A few drafts of pieces for the exhibition follow. There will be several of these mixed-media boxes in varying sizes arranged in a wunderkammer-type format. We are looking for additional venues to exhibit this work in 2014 (please contact us if you are interested). 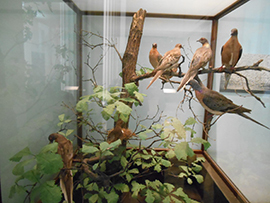 For more info about the centenary and Moving Targets see Project Passenger Pigeon. Thinking of these as part of a larger “tile” mural, with multiple components that can be arranged in numerous configurations. 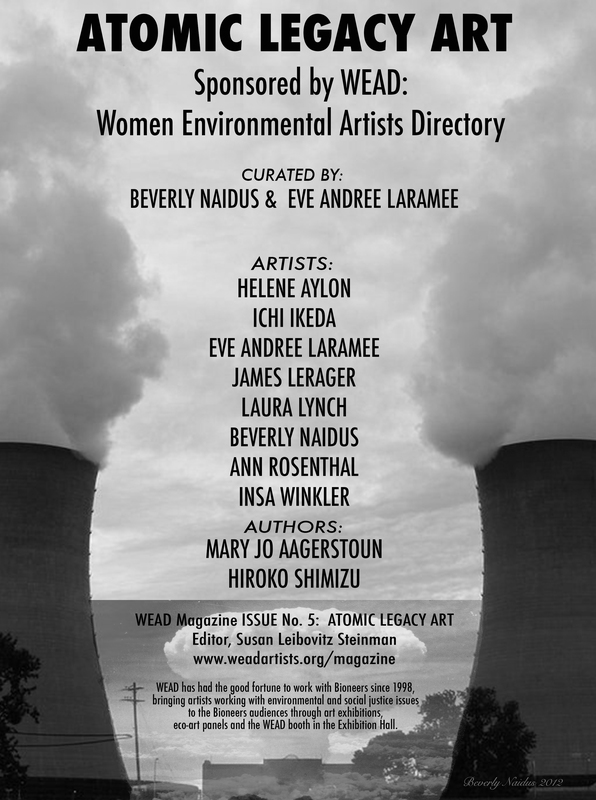 My essay “Infinity City: An Atomic Pilgrimage” has been published in the current Atomic Legacy Art issue of Women Environmental Artists Directory (WEAD) online Magazine. Infinity City was a decade-long (1994-2004) triptych of art installations in collaboration with Stephen Moore that reflected on The Bomb, nuclear energy, and living in the atomic age. Contributors to the Atomic Legacy issue will be exhibiting selections of their art work at the upcoming Bioneers Conference in San Rafael, California. I attended the conference in 2000. It was probably the most inspiring and life-changing conference I have attended aside from the UN Conference on Women in Beijing in 1995! It is worth every penny if you can get there! A glorious road trip with artist friend Ann Leda beginning on Vashon Island, WA – Mt. 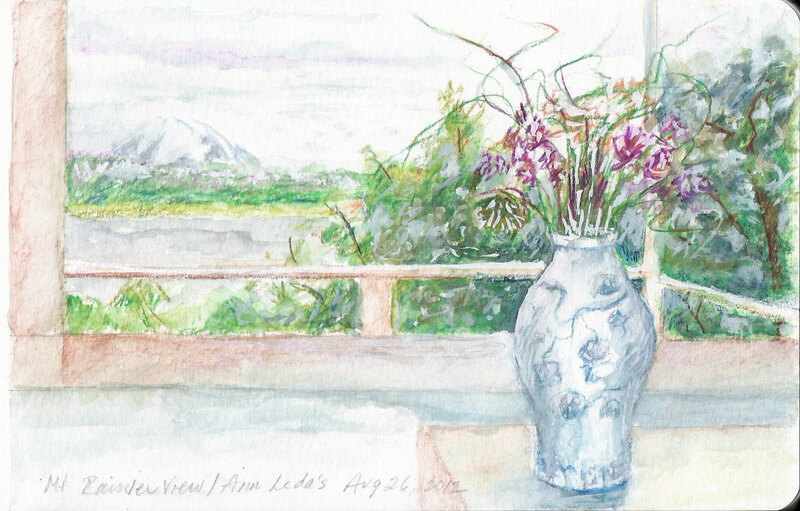 Rainier view from her porch (watercolor 1). 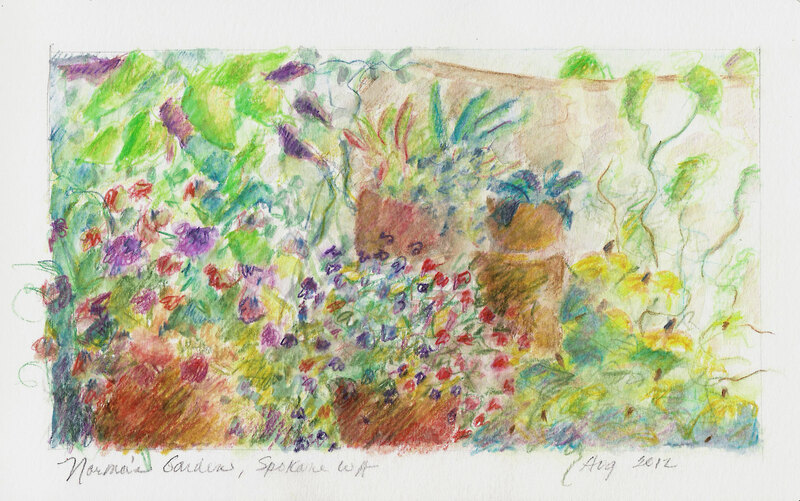 Stayed at the home of her friend Norma who has a lush garden bursting with color (watercolor 2). On to Pullman to celebrate the retrospective of my long-time colleague, mentor and friend, Jo Hockenhull at Washington State University. A pleasantly full reception and full moon party the next night with music and a spread of food. 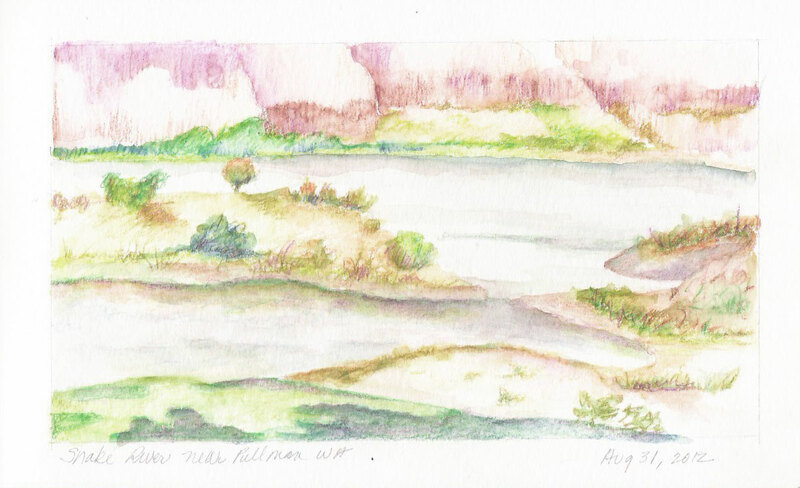 Managed a picnic and swim at the Snake River (watercolor 3) with art historian and writer Susan Platt and her architecture historian husband Henry. Lovely! Return trip through Yakima to visit artist/curator Cheryl Hahn, who is painting/collaging/staining wonderful organic works on wood panels reflective of the golden hills of the Palouse. Skirting Mt. Rainier back to Seattle and Vashon. Inspired by my friends’ continued art practice/research/writing, process, and production, awed by their deep creativity and commitment. 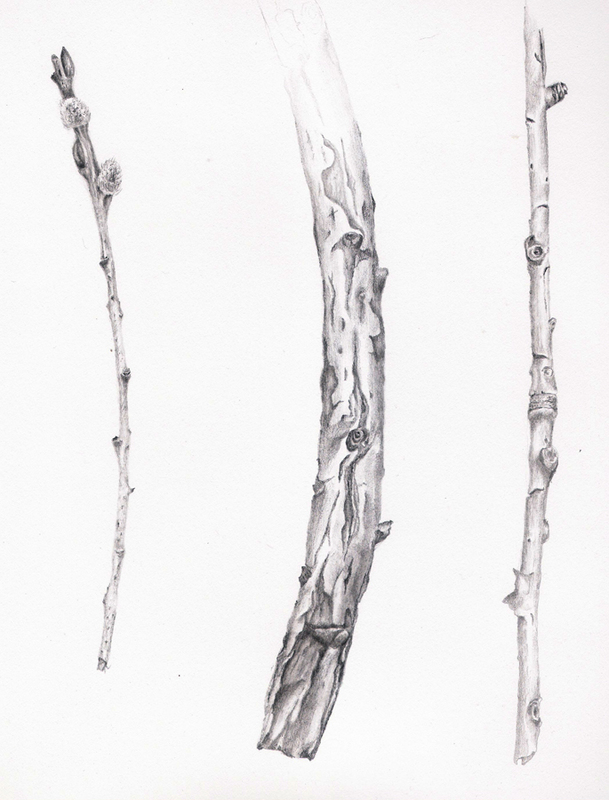 Trying to catch up with my second botanical drawing course, after the fact–twigs! Amazing variety. Look, observe, respect, admire.